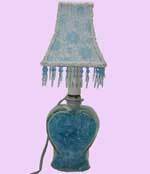 This week I'm focusing on a lamp I made using a heart shaped glass vase. It was originally intended for flowers; however, as I'm always looking for unusual bases for my lampshades, I thought this would be perfect filled with powder blue glass beads. I found the glass beads on a trip to Albany, NY to visit my best friend from high school. My husband added the electric candle lamp with a six foot gray cord with an on/off switch that comes out the top of the vase in back. It uses a 7-watt candleabra light bulb. The shade is handsewn with a layer of blue lace handsewn over the lining. I added white trim and blue crytal looking beads and there it is...ready for a bathroom or bedroom as a night light. Wouldn't this make a unique wedding or home warming gift? Or something to help freshen up one of your own rooms. You can purchase it at my website: http://www.shades-etc.com/victorian.htm.